DÉPÔT GÉNÉRAL DE LA MARINE - 4.me Carte Particuliere Des Costes De Bretagne depuis l'Anse de Goulven jusqu'a L'Isle D'Ouessant..
Map maker : DÉPÔT GÉNÉRAL DE LA MARINE. Size : 22.8 x 31.7 inches. / 58.0 x 80.5 cm. 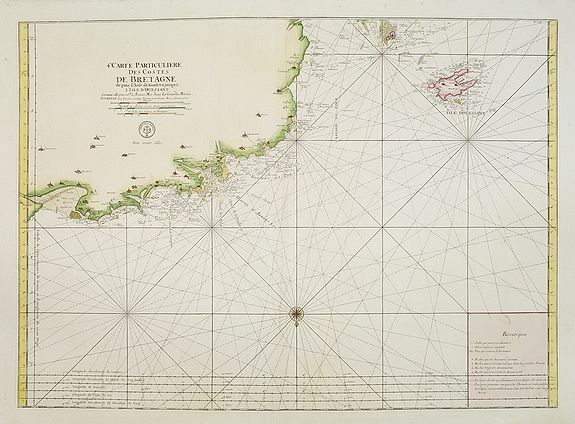 Description :Large-scale sea chart covering the coast of Brittany. With rhumb lines. Published by the Depot Générale de la marine with stamp and Prix. Trente Sols. Condition : Printed on heavy paper. Overall in very good condition.